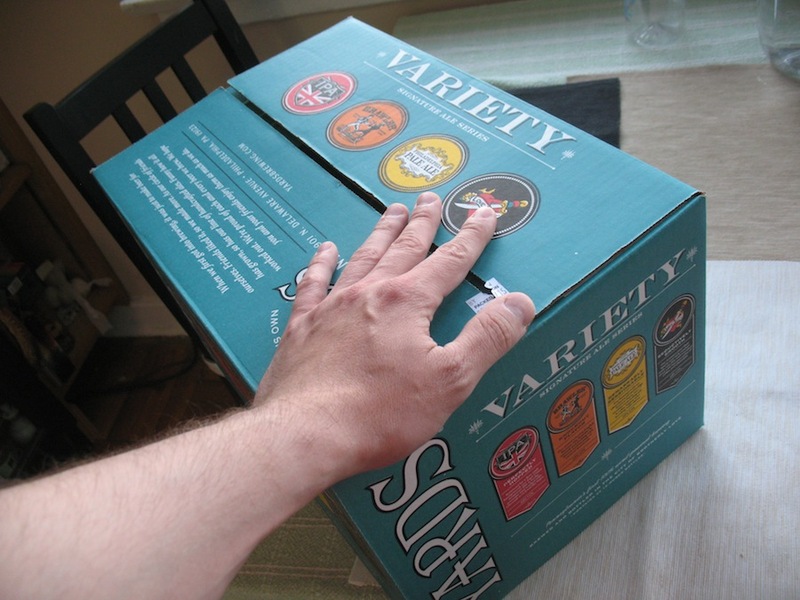 A variety pack case of Yards. One of the cases on standard rotation. Moving to Philadelphia from Madison, WI came with a few adjustments to our usual patterns of living, and casual shopping for groceries and beer came with a steep learning curve. If you live in the area, you are likely familiar with the concepts of “state stores”, “beer distributors”, and “bottle shops”. To those unfamiliar, alcohol is strictly sold by the State of Pennsylvania, with special retail locations for wine and liquor (“state stores”–basic selections with locations few and far between) and beer, which can be purchased at reasonable prices only at “beer distributors” where you need to buy a case minimum. Bottle shops offer a more frequent and available alternative for buying beer–but be prepared to pay top dollar for even very cheap beer. So, here in Philadelphia you really have to plan ahead if you will need a bottle to take to a friend’s for dinner or if you are in the mood for a beer after work. If you are lucky, your 2-mile radius will have a wine store, OR a beer distributor. If you are like most of us, you’ll have to instead pay a premium for a few bottles of beer or drive some distance to find a distributor or state store. Strangely, I haven’t found a useful map online for these locations. Good luck trying to find a neighborhood wine store open on Sunday! There are some open, but you have to be in the know as to which one is where. To help with this, I’ve put together a map with data from the PA Wine & Spirits stores website. Notice the color coding for stores open on Sunday. At the bottom of the page I’ve also included a map of Philadelphia beer distributors (generally open everyday). Hope you find this helpful. This entry was posted in - Guides and tagged beer distributors, map, open Sunday, Philadlephia, wine and spirits. Bookmark the permalink. You’re quite a ferret and a scholar, DD! There’s nothing strange about the fact that no map previously existed since the State Store system is a monopoly, as you discovered, and as such, feel no pressure to serve the consumer. Believe it or not, it’s better than it used to be. Helpful Hint: I knew these old people who used to carpool to make periodical trips to a state south of here (nudge nudge) to stock up on bottled items at more favorable prices tax free at some amazing superstores. Beer, microbrews, growlers, acres of wine and booze, including some fairly unusual items.They carry Everclear as well, something you need if you’re going to make cordials or bitters, or whatever. If you want to get it up here, you have to order it in advance or some sort of tango. Thanks for the map!